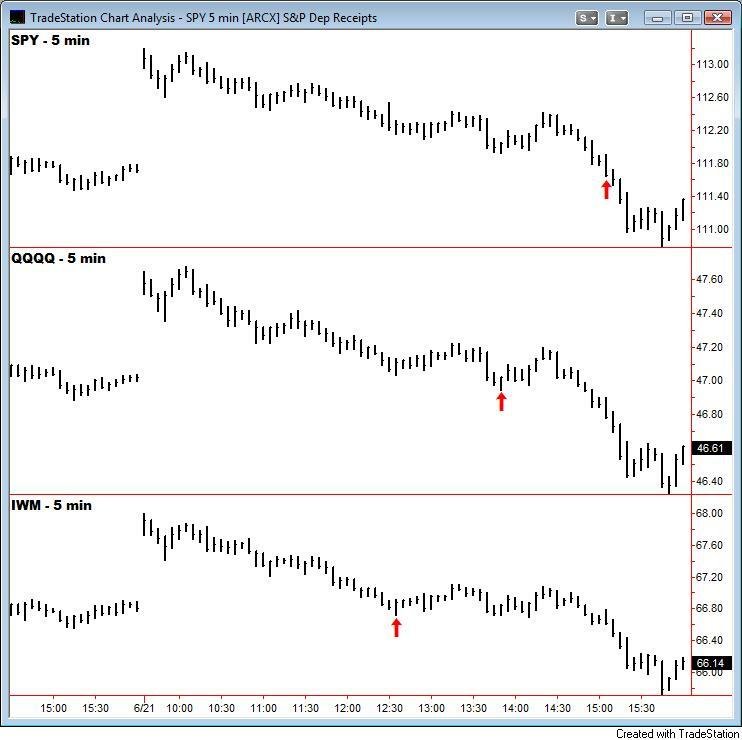 Notice how SPY gapped-up that morning and then proceeded to immediately roll over and close lower. The gap occurs at the end of a strong trend. The gap may be suspiciously larger than previous gaps within the trend. The gap is filled quickly; in five days or less. The period when prices are reversing occurs on high volume. 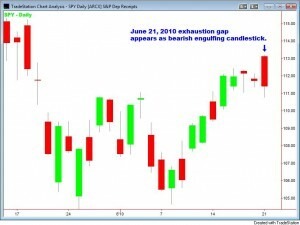 The gap occurs after a 100% extension of a pattern such as a flag. The gap is not the first within the trend. 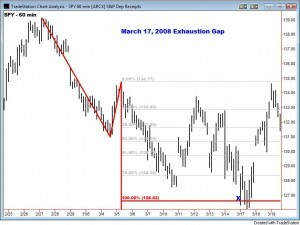 The gap occurs during an extreme of sentiment (euphoria or despair). 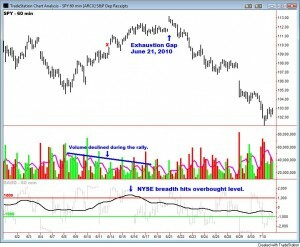 The gap occurs in overbought or oversold conditions. 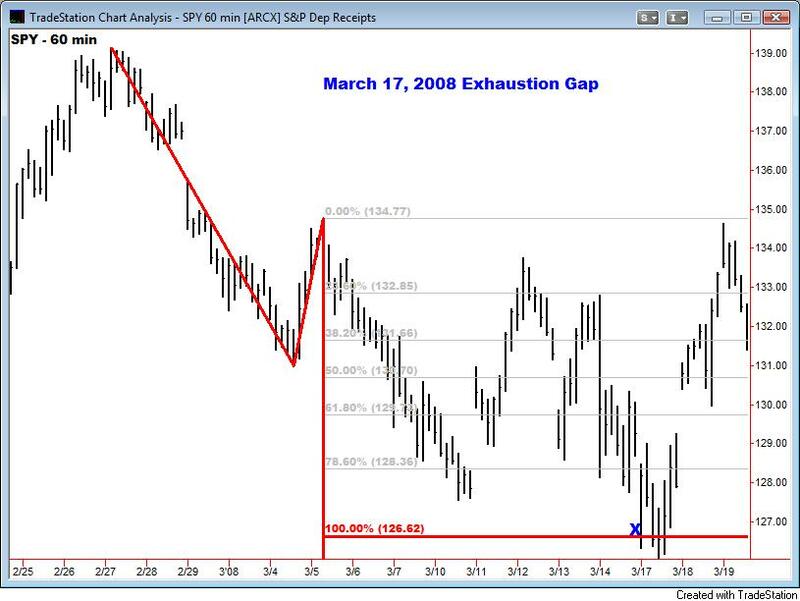 An exhaustion gap does not guarantee the end of the trend, but at least a slowdown or pullback. 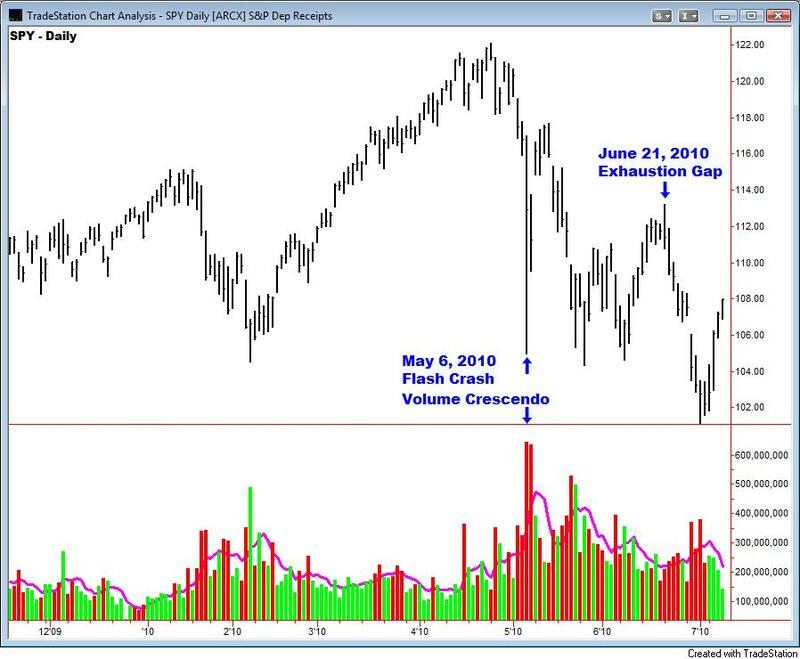 Looking back up at the first chart, you can see that the rally was suspect because the volume had been declining throughout. Larger players were not accumulating shares. 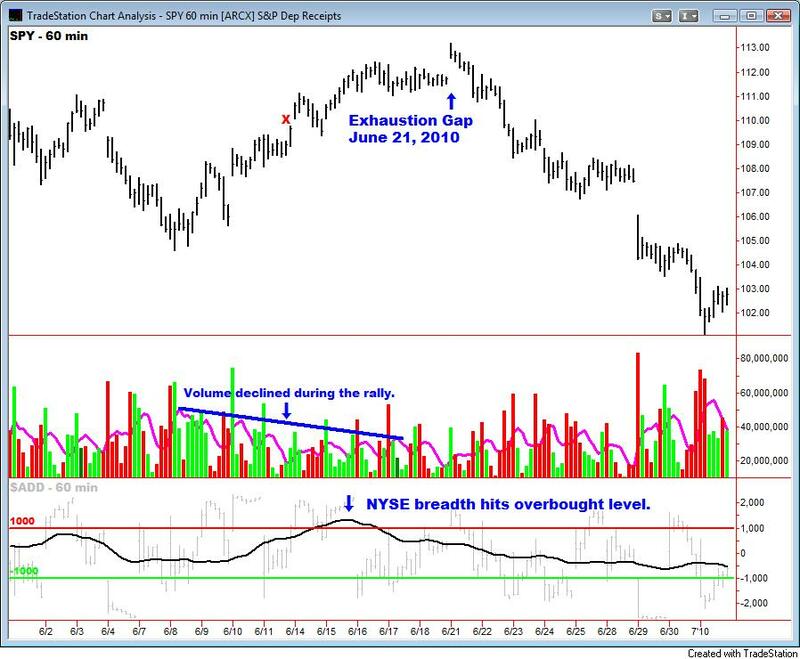 (The purple line on the volume chart is a five-hour moving average). The third panel on the first chart shows a moving average of NYSE breadth, which I like for identifying overbought/oversold conditions. 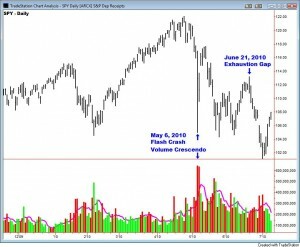 On June 21st, the market had made a recent overbought peak and breadth had begun to deteriorate. So, there was reason to suspect the gap. 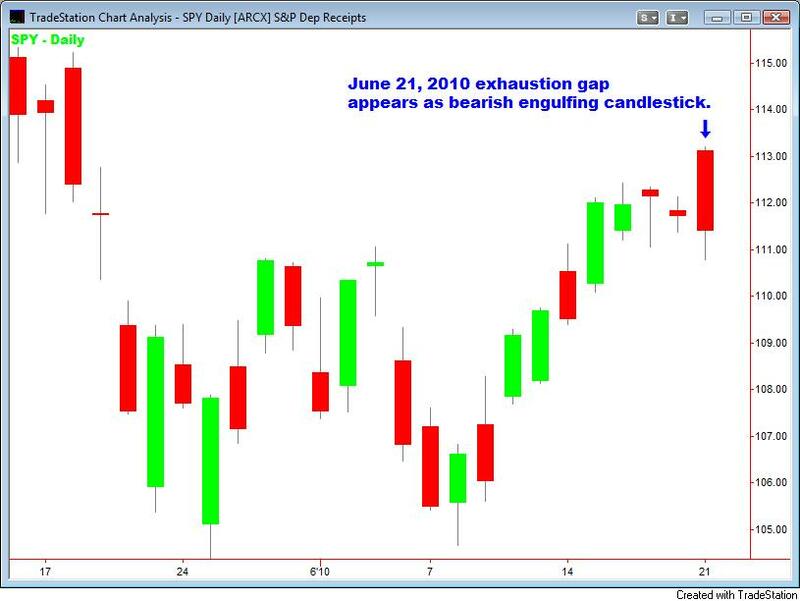 Now look at the red “x” on the first chart marking the June 14, 2010 gap. That gap looked a lot like an exhaustion gap, however it was not confirmed by the price action the next day. Nevertheless, if you had gotten out of long positions at that time, you would have been in good shape when the market dove a week later. 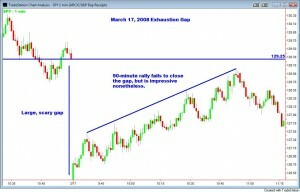 That gap was a warning that the trend was suspect because a powerful trend will not fill gaps so quickly. 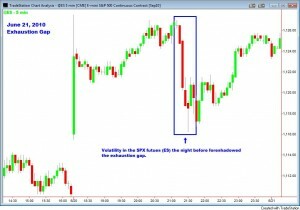 That type of volatility is characteristic of a turn rather than a continuation of the trend. 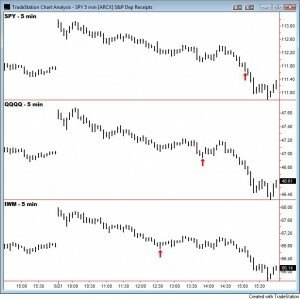 Bullish behavior would have been to gap-up and then grind higher or go flat. 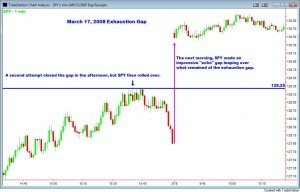 While the futures recovered from that plunge, it did indeed foreshadow the exhaustion gap the next morning. 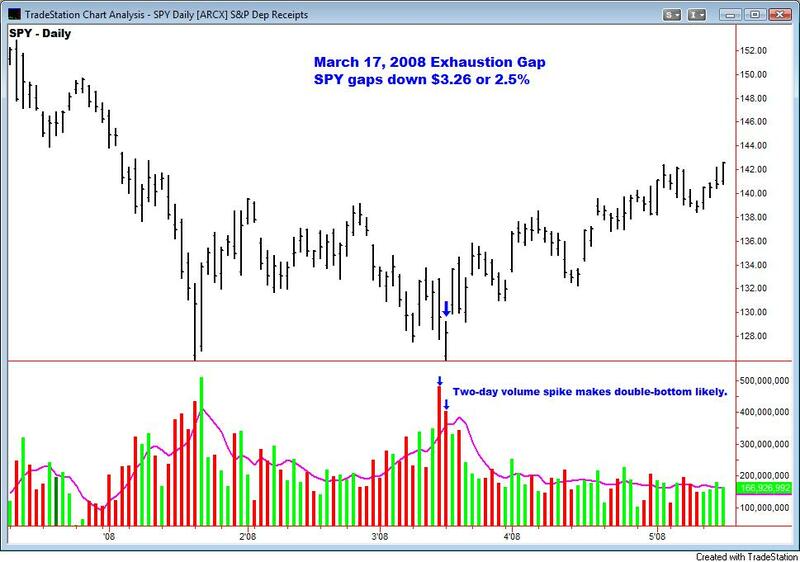 This gap had a volume crescendo of a magnitude that matched that of the crescendo which occurred two months earlier at the January 2008 low. That surge of volume was a signal that a double-bottom pattern might be forming. 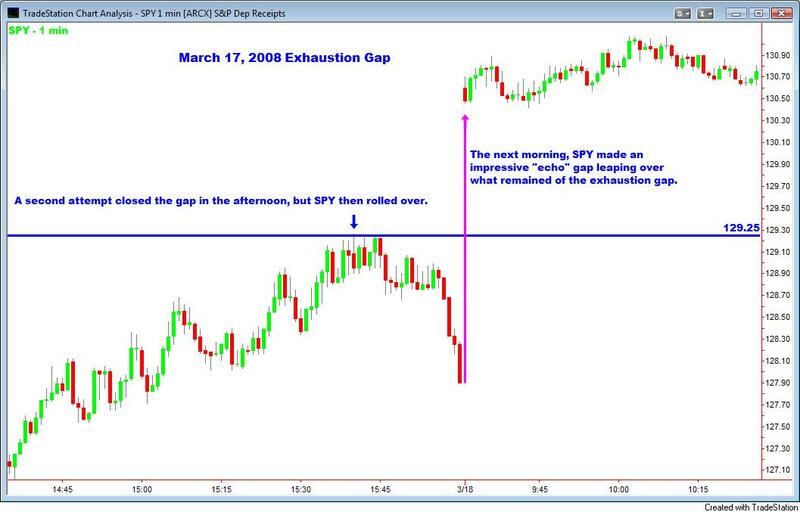 The next morning, SPY made an “echo” gap up-and-over the what remained of the exhaustion gap and went on to rally. 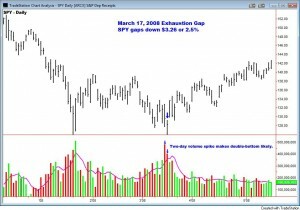 That echo gap remained open for over three months – until June 26, 2008. Whenever a powerful wave occurs, powerful emotions will likely build with it. And those emotions may reach a crescendo days later in the form of an exhaustion gap. 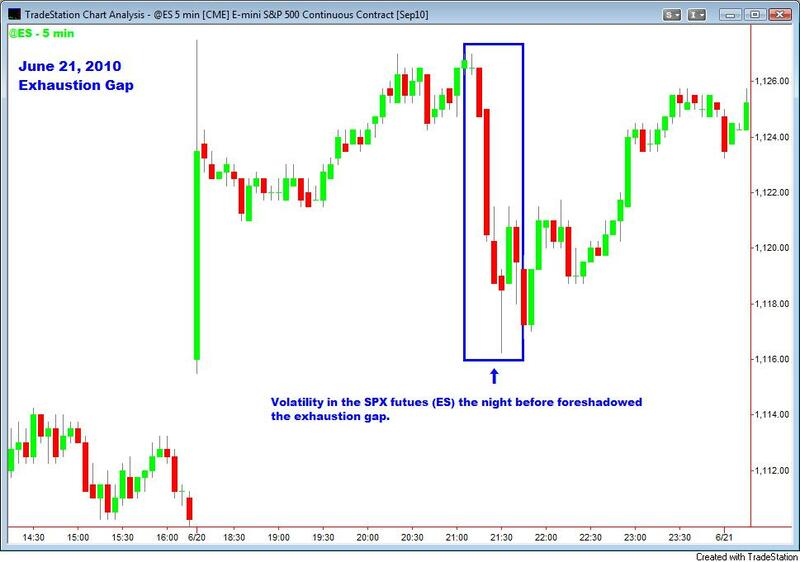 For more discussion of gaps, see my book: The General Theory of Day-Trading. For example, it has a fascinating theory of mirror-gaps.